For the park's tenth season the crowds continued to grow and to keep up and continue the momentum, three big new attractions were introduced. 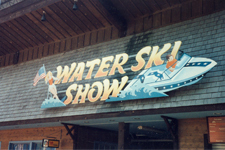 A new show venue was added with the Great Lake Grandstand and Water Ski Show. 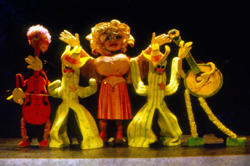 The lake had been drained and the stumps removed over the off-season, and the new show opened in the spring. 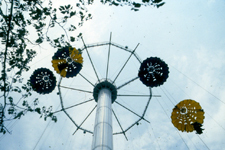 The world's tallest ride came to Great Adventure for 1983 with the introduction of the Parachuter's Perch. The 250' tower was relocated from Six Flags Over Mid-America and positioned at the top of the Goodtime Alley games area as a visual draw to bring guests past the games. 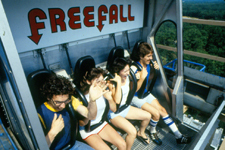 The real star attractions of 1983 was the Freefall ride, the first ride of its kind in the area. 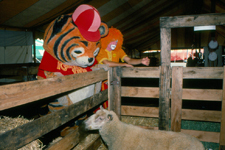 The state of the art attraction was an immediate success drawing huge crowds. Six Flags had introduced the same ride at several of their parks simultaneously, and created a commercial campaign that piqued the interest of thrill seekers. 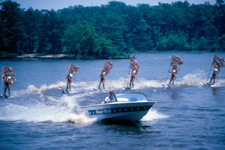 Other new attractions at Great Adventure in 1983 included new fireworks shows on the lake, new shows in the Americana Music Hall and new costumed characters with the introduction of the Shirt Tales. Kiddie Kingdom was remodeled as Shirt Tales Land and the area was modernized with new attractions. To help handle the ever growing crowds, a major new food location was added to the park with the addition of the International Food Fair. 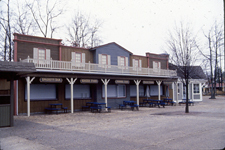 The western themed building featured multiple counters each selling different types of food from around the world. Despite a severe economic recession, the park set new attendance records and things were looking good for the future.